Erin: I’ve gotten a lot of questions about the fangirl storyline — some over email, and some in other ways, like over IM or in person — so I’m tackling them all at once. We’ll stat with an easy one: 1. “How many fangirls are there?” All totaled, there are seventy-eight. Here’s the breakdown by character. Note that I use the term “fangirls” generically; sixteen of these are technically fanboys. Incidentally, here’s the breakdown by pairings they ship. (Most ship more than one.) Probably SxP will gain popularity as the manga comes out and Pip gins recognition. Originally they were all just meant to be generic fans — all loosely based on me. There’s one exception: the Alucard fangirl is my friend Maddie. Yep! 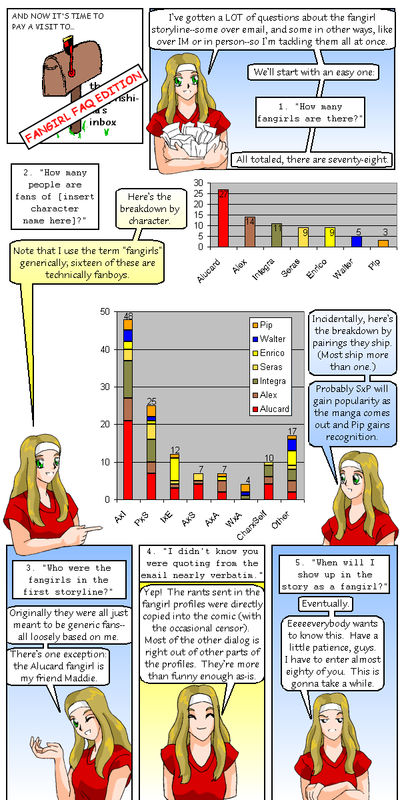 The rants sent in the fangirl profiles were directly copied into the comic (with the occasional censor). Most of the other dialog is right out of other parts of the profiles. They’re more than fanny enough as-is. Eventually. Eeeeeverybody wants to know this. Have a little patience, guys. I have to enter almost eighty of you. This is gonna take a while.